Disasters, as Maurice Blanchot has observed, ruin everything while leaving everything unchanged. This Thursday April 26, I shall have the pleasure of pursuing this idea further in the company of noted author Tony White at the Freeword Centre as we discuss his latest published work, Dicky Star and the garden rule. A narrative irradiated by the media fallout from Chernobyl, Dicky Star and the garden rule is published by Forma Arts and Media to accompany Atomgrad (Nature Abhors a Vacuum) by artists Jane and Louise Wilson. Commissioned by Forma to coincide with the 25th anniversary of the 1986 Chernobyl nuclear disaster Atomgrad (Nature Abhors a Vacuum) is a suite of large-scale photographic prints, depicting deserted interiors from the now almost entirely abandoned town of Pripyat, situated within the 30km wide Exclusion Zone. The richly textured images of former public spaces include a kindergarten, cinema and a swimming pool, all of which explicitly reveal years of decay and the hurried nature of their abandonment. Dicky Star and the garden rule follows young couple Laura Morris and her boyfriend Jeremy through the turbulent days at the end of April 1986 when the world’s worst nuclear accident occurred at the Chernobyl nuclear power plant in the Ukrainian Soviet Socialist Republic of the former Soviet Union. Tony White’s narrative reveals Jeremy and Laura's story in vivid daily chapters that follow the disaster’s impact in the UK, but are also each determined by their own quixotic puzzle: each daily chapter must be told using all of the answers to the Guardian Quick Crossword from that day in 1986. 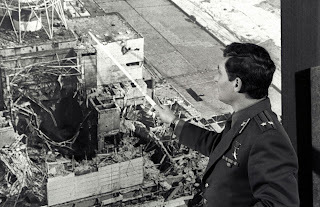 The story occupies the Chernobyl time-line, from 26 April 1986 when the accident occurred, until 7 May when reports of the true scale of the disaster were printed in UK newspapers following the Kremlin press conference of the previous day. Rather than work with Jane and Louise in Ukraine or to have drawn too heavily upon the unique interviews and testimonies that they have been collecting in the course of their own research, it seemed pertinent to explore, in a work of fiction, the same events from a UK perspective and using contemporary print media as my primary source. A metaphor for this approach might be that of the scientific control. In an experiment – e.g. one designed to test the effects of a particular drug – the control is of course the experimental sample that remains untreated or subject only to some standard or pre-existing variable or attribute in contrast to, or to provide a point of comparison with the main, treated sample. My own research draws on two main sources. Firstly, the Leeds Other Paper archive, which is held in the local and family history section of Leeds Central Library. LOP was an independent, alternative left-wing newspaper published between 1974 and 1994 in that city, where I lived during the period in question. Secondly, archive copies of the Guardian newspaper held in the British Library’s national newspaper collection at Colindale, London. Alongside the LOP’s prior anti-nuclear content, its critical stance and its notable dissemination of accurate scientific information about risks posed by ‘the cloud’ (as the plume of Chernobyl fallout was popularly referred to at the time), and the Guardian’s own extensive coverage of the disaster, I was particularly drawn to the then broadsheet’s back pages, to Steve Bell’s memorable cartoons of radioactive sheep and to the two crosswords, especially the Quick Crossword which I had been fond of doing at the time. 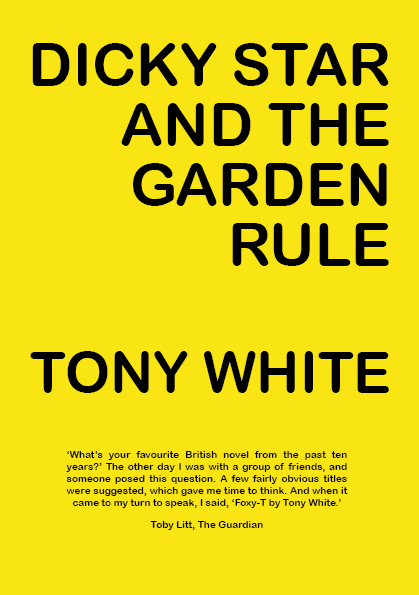 Forma is delighted to announce a launch event to celebrate the publication of a specially commissioned work of fiction by Tony White, author of the critically acclaimed novel Foxy-T (Faber and Faber). Tony White will read excerpts from the book and be joined in conversation with writer and broadcaster Ken Hollings. Followed by drinks reception. RSVP essential. Please email Divya Thaker on dt@forma.org.uk or +44 (0)207 456 7820. Chernobyl image found on The Atlantic website.